today’s second diy project comes from designer julie reed. in addition to crocheted and sewing some beautiful pieces for her etsy shop, julie also knows her way around a mean crocheted bath rug. and since i’ve still got affordable bath decor on the brain from last week, i thought this would be the perfect project to share. click here for julie’s full instructions or just click “read more” below. stay tuned for lauren and derek’s diy wednesday post at 1pm! About the project: This project evolved due to my interest in crocheting and and antique/vintage handwork. As I love and admire the workmanship in antique/vintage crocheted items like potholders and doilies, I thought it would be interesting to see how I could translate the old into a modern version. 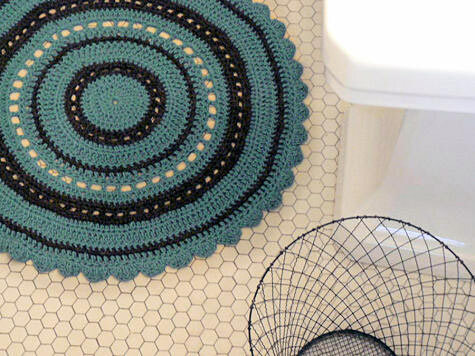 To keep things simple (I thought), I started out with a doily pattern from 1918 – I thought that if I used bulky wool yarn and a large crochet hook, I would end up with a rug sized doily. Not so! After several attempts, I gave up on the pattern and created my own from scratch. The rug is worked in the round with a combination of single, half-double & double crochet stitches and measures 27″ in diameter. The biggest challenge was keeping the edges from ruffling – as the diameter gets larger, stitches must be decreased to avoid ruffling. Now I am curious to see what it will look like felted! Intermediate crochet skills are necessary for this project. 1. Start with a vintage doily or potholder pattern if you like – there are many to be found on the internet for free personal use. (Here is one place) OR, be adventurous and create your own pattern. Either way, you will probably have to make modifications depending on what type of yarn you choose. 2. Crochet in the round until rug measures the diameter desired. You will have to increase stitches in the first 6-7 rows, then as the diameter increases, you will have to decrease stitches in order to keep the rug flat. It takes a bit of patience, but the end result is worth it! Blocking will take care of slight ruffling. 3. Weave in ends, trim. 4. Block with a steam iron and cotton towel. Would you be willing to provide your actual pattern? Also, do you have any problems with it sliding all over the floor? What kind of yarn is best to use for this project? I mean generally, as I have quite the stash and don’t want to purchase new yarn..
Where is that toilet paper rack from? I love the idea of an easy access toilet paper ‘display’ in the bathroom! Man, Julie is stocked on the TP front! I seriously love that holder/rack on the right, is that another DIY project? 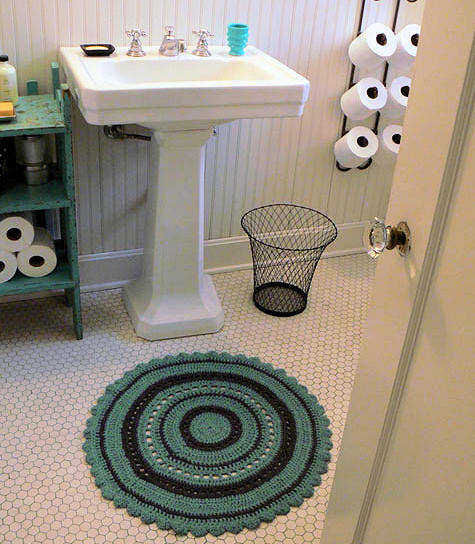 cute rug… and it looks like she’ll never run out of toilet paper!! I have the exact same “towel rack” in my bathroom and I hang toilet paper on it too! I thought I was just a geek – guess not! Hmm. Holy cow! That is uber-cute! What a great way to customize a scheme and kudos to Julie for adding such a nice detail to the bathroom. Lovely. Oh I adore this. Love the color combination as well. i love the bright color on the white tile. nice! Thanks for all of your comments! I guess my hoarding of TP is not a secret anymore. As far as the towel/TP rack goes – I have had that for quite a while – I believe it is from Pottery Barn. As for the questions regarding the rug, I plan to offer up a pattern for sale on etsy in the near future. I don’t use the rug as a bath mat so I have not had an issue with the rug sliding. I chose wool yarn for this project – check the details for the exact kind – I plan to make another and felt it to see what that looks like. Now to find some extra time……. I am also working on a crocheted bathmat with a twist (soon to be available on my Etsy! ), and attaching the grippy type shelf liner (mine is from the swank Dollar Tree) to the bottom helps with slipping. Actually, I didn’t mean attach so much as I meant “place underneath”. It would turn into a hellish rubbery mess when washed otherwise! This is just cause to work on building my crochet skills. Beautiful! I love the choice of color. This is beautiful. I have been poking around for a new bath mat, but think I’ll just hook me this one. One suggestion: using a cotton/bamboo blend instead of wool. More absorbent, machine washable, and will keep it’s shape better. Will also be super soft on your bare feet. This is so beautiful! It reminds me of the crocheted bathmats I used to buy at outdoor markets in Brazil. They were made of cotton (and machine washable) and looked somewhat similar, although were cream-colored, not the great colors here. I was wondering where you got the black wire basket? I love it. Just checked on Pottery Barn’s webpage. No such luck with the toilet paper holder. Does anyone have any idea where else to get one like that? I’m in love with the idea of never being out of toilet paper! yes, me too ! pls email me if you know where to get the toilet paper holder. For those who want to work up their own pattern – in double crochet, a starting round of 12 with 12 increases in every following round will usually give you a flat circle (for hdc, 8 sts/incs, and for sc, 6 sts/incs). Throwing in rounds of different stitches will result in needing to adjust the stitch count as you go. or, if that doesn’t work, the item # is 180240219711. It still has 2 days or so for bidding so one person could get lucky! I got the wire basket long ago as well – my best advice is to hit flea markets and antique shows. I have made crocheted rugs before and I have found that they just don’t stay put. Do you have any suggesstions as to how to keep them in place while they are on the floor? I was going to ask about slippage, but April already gave us the answer! Fabulous pattern, and I already have some of that non-slip stuff to put underneath. Can’t wait to see this in our bathroom! I can’t believe you made that! It is great! Looks like the one from my childhood! Hi! Love this rug – did you ever publish a pattern anywhere? BEAUTIFUL rug! Have you ever offered your pattern for sale? My sister & I both want one! A few judicious beads of hot glue on the backside of that rug will stop any slipping PDQ.